Q : How do you view violence that erupted in the Kandy district? I look at it from a different perspective. Sri Lanka is under a huge, cultural,social and economic invasion from international elements. Economic invasion has been successful to a great extent. We are an agriculture society with a long cultural and civilization history. Unlike in other parts of the world, our agriculture is intertwined with spiritual development. There is an assault inflicted on our agricultural sector today. Fertilizer is not issued properly. Paddy lands are left to be barren. No proper pricing was done for the agrarian produce. There is a sinister move, hatched out strategically to destroy this culture. I don’t know whether the government realizes this. The government voiced for organic agriculture. Today, rice is imported from the countries such as India. We never know agro-chemical contents accumulated in imported rice grains. This is one example. In our country, we have 57 traditional yam varieties which are edible – Ini Ala, kiri ala etc. Today, we consume mostly potatoes. A fast-food culture dominates the eating habits of people. It has caused health hazards such as juvenile obesity, diabetes, high blood pressure etc. Children are not properly advised on this. We have to be conscious about our health. I doubt whether successive governments are aware of this. We, as religious dignitaries are responsible for developing spirituality among the people. I must admit this is not done properly. If you compare Buddhism to a canoe, we have to get into it and paddle it on. Instead, we should not carry it on our heads. We have to absorb the essence of our religious teachings. Cultural invasion is acute today. We lived as families. All the members of the family used to sit together for dining. Today, it does not happen. One serves his/her food and sits glued to the TV. Therefore, to an extent, technological innovations have played negative role in our lives. We must fall in line with the trend, but should not be westernised. All our cultural values bear scientific factors. After attending a funeral, for example, we do not enter our houses without sprinkling some lime juice on our heads. That is to disinfect the germs which are settled in hair. Our parents used to keep basinful of water mixed with lime juice at our doorsteps for us to apply it on our hair before entering. We did not know the scientific basics behind this during our village life. Q : Actually, what are the reasons for violence that erupted in Kandy? I went to Kandy. I think such violence was manipulated to destabilize the country. This is part of a conspiracy to infiltrate into this country through a different access. Regardless of addressing the needs of our people, those concerned live to satisfy the Western world. Amidst chaos, the government fulfils the whims of the West. Since the good governance came to power in 2015, they brought various legislations targeting the monks. The government introduced Bhikkhu Katikawak Bill. We protested against it and that was shelved. The government resorted to vilification of Bhikkhus. Afterwards, one Minister vilified me, but nothing happened to me finally. Then only I realized how affectionate our people were towards me. People taught a bitter lesson to that politician at the local government elections. Q : What should be done from your view to come out this crisis? The government started using certain terminologies such as reconciliation and good governance. These are beautiful words found in our vocabularies. Eventually, the government has made a mockery of such phrases. Only the government distorted their linguistic meanings. People feel repulsive to use these words. These words have been coined by the West. In the past, politicians coined the phrase ‘Pious Society (Dharmista Samajaya)’. It was practised by some politicians who relate themselves to Buddhists. But, they never lived up to that reputation. Buddhism is nothing but enlightenment. We, as Buddhists, should get enlightened. In fact, we are enlightened enough, therefore, problems will not arise. Q : What were your observations during your visit to the affected areas in Kandy? I asked the President to make his Ministers aware of what they utter. One Minister asked the Buddhists to apologize to the Muslims. We, as Buddhists, have done nothing to harm anyone. People live in peace and co-existence. Even lands belonging to Sri Dalada Maligawa are used by non-Buddhists. We never protested. There is no racism existing among us. However, the current crisis has been manipulated to introduce an Arab Spring here. I received a call from Eravur where Tamil youths stood guard to protect two shops owned by the Sinhalese. This is nothing but an international conspiracy to destabilize the country. Q : Do you believe whether this international conspiracy has been hatched with the connivance of the govt leaders? This government was installed by the West. I regret the plight of President Maithripala Sirisena. 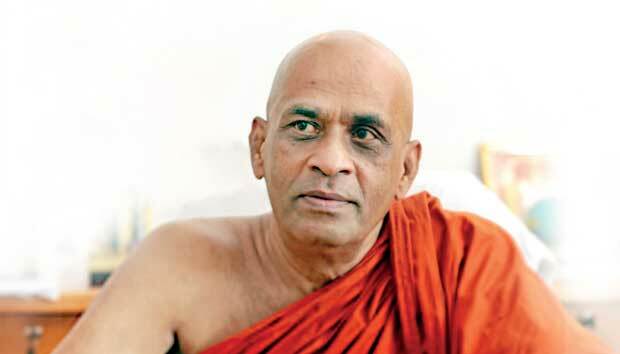 He hails from a Sinhala-Buddhist background and from a farming family. He is rooted in our culture. But was drawn in to this conspiracy. Q : You maintain close links with the President. Have you discussed this with him personally? I told him. He would be visiting me soon. Q : In your view, how can we bring about harmony among the communities? In the guise of attempting to bring about reconciliation, some people create enmity among communities. A minister, in a recent TV programme referred to a Muslim as brother and a Sinhalese as just a person. Former President Mahinda Rajapaksa’s party could win the local government elections riding on the nationalist sentiments of people. Whereas, he did not win on issues such as the cost of living etc. People had a belief that the proposed new Constitution would lead to divide the country. We, the Sinhalese, Tamils, Muslims, Malays and Burghers should be unified. Let’s build the country in diversity. But, let’s not become the cat’s paw of any politician. We have to work out a national action plan in consultation with each other. We can ask for their views on issues of their concern. The intelligentsia, representing all the communities, should sit together for talks. Yet, we have to leave out those so-called intellectuals aligned with NGOs. There are intellectuals working with me. I can invite them for such a dialogue. We have to find out the root causes for the problems. The current crisis has been engineered by the west. Q : According to your opinion, where would the current political situation be heading to? I think the leaders, such as MR should be more proactive than they are today. If this situation persists, the country would be plunged into further darkness. If he takes over, it would be difficult for him to resuscitate country. I stand by my position. I too can remain quiet till the government gets enmeshed in more and more chaos. At the end, it will be my country that suffers. In the event of a national calamity, we all should stand together. It happens in other countries. Q : Do you believe that President Sirisena and Mahinda Rajapaksa should forge ties now? They should spell out as to why they should get together. If they get together to divide the country, I will say no. If it is to protect the country, I will be for it. I agree if they tie up with each to protect the national assets of the country. I have put forward my conditions – protection of national sovereignty and national assets and the abrogation of the constitution-making process. Q : What do you think of the next Presidential Election? I have made a statement. I am rallying Buddhist monks in view of it. We cannot continue to live with this plight. We have been suffering since the Independence. No government has given us anything. We who gained the Independence. But, it is like untethering a cattle head within its enclosure. The beast is untethered. It is still inside the enclosure, though. Our Independence is also like that. We still think inside the box in the colonial perspective. We need a thinking revolution. All the communities – the Sinhalese, Tamils, Muslims, Burghers and Malays should strive to build the country. I am ready to take the leadership for it. We should not leave the problems to be addressed by politicians. We suffer today because it was left for the mercy of the politicians. As a result, no community is happy today. Since 1948, we only served as doormats for politicians to come to power. Today, there is no one to take the responsibility for the bond scam. Who gave the character certificate to the person responsible? People should question about it and urge the leaders to get this person back to Sri Lanka. The country suffered a colossal loss. Who is going to bear it? Eventually, it is the poor masses who have to bear the brunt of it. Is this true ? Where is the investigation ? If nto hwy not arrest Kithsiri Wijesinghe ? Is STF under Champika Ranawaka or Mahsona ? Why not arrest Champika ? Details are emerging of Sri Lanka security forces and public officials collaborating with ultra nationalist Sinhala Buddhist mobs in a riot against Muslims. Doctors on duty in a government hospital denied treatment to injuries from a severe beating by members of the island’s elite police combat unit, alleges a Muslim official from the central hills. A Sinhala doctor at the Theldeniya hospital had turned down the request to treat bleeding head wounds received at the hands of the Special Task Force (STF), Abdul Saleel Mohamed Fazil told JDS by phone. The doctor had repeatedly referred to the wounded man as ‘Thambi’, a derogatory Sinhala term widely used against Muslims, while other medical officers looked on. “The doctor accused me of being a ‘Thambi’ terrorist,” said the 43 year local councillor who says that the STF tried to frame him and two others for racial hatred when Muslims were under attack by Sinhala extremist mobs on 5 March. Mohamed Masood Faizal (40) and a student of Madawala Medina Central College were also mercilessly beaten up alongside Councillor Fazil by more than a dozen of STF personnel. Mohamed Fazil received head injuries and the police had to take him to the hospital. Released on bail by court the next day and admitted to the Kandy district hospital, Fazil’s head wound had to be sutured. They had not been given an opportunity by Theldeniya District Judge MH Fariqdeen to explain the circumstances surrounding their presence in court. “Since the day of that incident, my kids wake up every night screaming” said Masood Faizal. “They ask whether the armed troops would come and beat us again. Now I am scared for my family’s safety” he added. Five days after anti Muslim riots hit the central hills, Army Commander Mahesh Senanayake visiting the area announced that thousands of troops have been deployed in the Kandy district as the “police were unable to bring the situation under control”. However, addressing a top level meeting in Kandy a Muslim Cabinet minister detailed incidents where the military was also assisting rioters. “Muslims have lost faith on the security forces,” said a visibly frustrated Minister Abdul Haleem, who hails from the area. He went on to describe an attack where the STF chased away Muslims who gathered to safeguard a mosque and allowed a Sinhala mob to “finish their job within an hour”. Abdul Latif, an elderly Muslim from Endarutenna, Katugastota broke down in front of the meeting when he went on to describe how telephone calls to three military commanders for help was ignored. “None of them even bothered to answer the phones. We have nothing left now. The mobs have destroyed everything” he said. Prime Minister Ranil Wickremesinghe visiting the riot torn area thanked the security forces for “bringing the situation under control”. He placed the number of damaged places of worship, buildings and vehicles at 465. In a public appeal for relief, officials of the Masjidul al Akbar Jumma mosque in Rajawella, Digana say that over 4000 families in many Muslim neighbourhoods have been affected by the violence. he problem we have is the Sinhalese are divided. If not we are doomed. This entry was posted on Wednesday, March 14th, 2018. You can follow any responses to this entry through the RSS 2.0 feed. You can skip to the end and leave a response.